Bright Sheng is one of the foremost composers of our time, whose stage, orchestral, chamber, and vocal works are performed regularly throughout North America, Europe, and Asia. Many of Sheng's works bear strong Chinese and Asian influences, a result of his diligent study of Asian musical cultures for over three decades. He was proclaimed by the MacArthur Foundation in 2001, "an innovative composer who merges diverse musical customs in works that transcend conventional aesthetic boundaries." The Foundation predicted that "Bright Sheng will continue to be an important leader in exploring and bridging musical traditions." The 2016-17 season marked a new page of Sheng's career. On September 10, The San Francisco Opera premiered his much anticipated new opera Dream of the Red Chamber, a 150-minute opera in two acts, with overwhelming public and critical acclaim. Within weeks of the premiere, the tickets were sold out for the full run; and within the first week, a two-minute online clip of the opera by China Daily received nearly four million hits worldwide. Sheng, as both the composer and co-librettist, had the privilege of collaborating with a dream team of artists: David Henry Hwang as co-librettist, Stan Lai as stage director, and Tim Yip as art designer. At the same time, on September 28, the San Francisco Symphony, led by Michael Tilson Thomas, premiered his Dream of the Red Chamber Overture, especially written for the symphony's Asian tour of China, Japan, and Korea in November of 2016. In March 2017, Dream of the Red Chamber was the closing highlight for the Hong Kong Arts Festival (a co-producer of the opera), with the entire run selling out six months prior to the performance dates. In May, his Postcards for chamber orchestra was given its New York premiere by the American Composers Orchestra premiere. The season finished with the world premiere of the 2016 revision of his Concerto for Orchestra: Zodiac Tales by the National Symphony Orchestra in Washington D.C. Part of the farewell concerts for Music Director Maestro Christoph Eschenbach, Zodiac Tales was programmed alongside Beethoven's Ninth Symphony. Born on December 6, 1955, in Shanghai, Sheng began studying the piano with his mother at age four. During China's infamous Cultural Revolution, at fifteen he was sent to Qinghai — a Chinese province bordering eastern part of Tibet — where for seven years he performed as a pianist and percussionist in the provincial music and dance theater, and studied folk music of the region. When China's universities reopened in 1978, he was among the first students admitted to the Shanghai Conservatory of Music where he studied composition from 1978-82. He moved to New York City in 1982; and, at Queens College, CUNY, he studied composition with George Perle and Hugo Weisgall, earning his MA in 1984. He earned his DMA in 1993 from Columbia University where he studied composition with Chou Wen-Chung, Jack Beeson, and Mario Davidovsky. In 1985, as a student at Tanglewood Music Center, he met Leonard Bernstein, who soon became a pivotal mentor. Sheng studied composition and conducting with Bernstein privately, and worked as his assistant until Bernstein's passing in 1990. Sheng's contributions to the lyric theater began with his appointment as the Composer-in-Residence at the Lyric Opera of Chicago (1989-1992). In collaboration with librettist Andrew Porter, Sheng created his first opera, The Song of Majnun (1992) — an one-act, Persian "Romeo and Juliet" story. The opera subsequently received five other productions nationwide and was recorded by the Houston Grand Opera on the Delos label in 1997. In the following decade Sheng penned two more major stage works, The Silver River and Madam Mao. Madam Mao, a two-act full opera, was commissioned and premiered by the Santa Fe Opera in 2003 and set to a libretto by stage director Colin Graham. It portrays Jiang Qing, Chairman Mao's repressed, vengeful wife, who was one of the leading architects of the Chinese Cultural Revolution. Michael Kennedy of the Telegraph (London) hailed the opera as "…extraordinary music and a riveting evening in the theater." In 1999, at the invitation of President Clinton, Sheng received a special commission from the White House to create a new work honoring the visiting Chinese Premiere Zhu, Rongji. The resulting Three Songs for Pipa and Cello was premiered by Wu Man and Yo-Yo Ma during the state dinner hosted by the Clintons. In 2001, Sheng was named the MacArthur Foundation Fellow, and received the American Award in Music from the American Academy of Arts and Letters, as well as an ASCAP Achievement Award the following year. The multi-cultural music theater work The Silver River (co-commissioned in 1997 by the Kennedy Center, Chamber Music Society of Lincoln Center, Santa Fe Chamber Music Festival, and Chamber Music Northwest) was Sheng's first collaboration with librettist David Henry Hwang; it received a visually stunning production staged by Ong Keng Sen. The production was co-commissioned with the Prince Music Theater in Philadelphia and premiered by the Spoleto festival, USA, in 2000. The Silver River has been performed subsequently in Philadelphia, in Singapore by Theaters Works, and was a highlight of the Lincoln Center Festival in 2002. In 2003 Carnegie Hall presented a Sheng portrait concert in its "Making Music" series with the principals from the New York Philharmonic and the Shanghai Quartet. In the same week the New York Philharmonic premiered its commissioned work, Song and Dance of Tears — a quadruple concerto for cello, piano, pipa, and sheng, featuring soloists Yo-Yo Ma and Emanuel Ax, Wu Man, and Wu Tong, conducted by David Zinman. Sheng served as the artistic advisor for Yo-Yo Ma's Silk Road Project from 1998 to 2003. In 2008, Bright Sheng continued the Silk Road project, a field research trip traveling through part of the southern route of the Silk Road, including Vietnam and southern China. He also was among the composers chosen by the Beijing 2008 Olympic Games Committee to composer music for the opening ceremony. In the world of chamber music, Sheng has worked with the Takasc Quartet, the Emerson Quartet, the Shanghai Quartet, the St. Petersburg String Quartet, and many others. In 2007, Sheng's String Quartet No. 5 was commissioned and premiered by the Emerson Quartet, and immediately became part of their touring repertoire. Sheng has enjoyed many collaborations with esteemed choreographers; From 2006-2008 Sheng was the first-ever Composer-in-Residence for the New York City Ballet, where he first collaborated with the prodigious choreographer Christopher Wheeldon on a new ballet The Nightingale and the Rose. In 2002, Helgi Tomasson, the Artistic Director of the San Francisco Ballet, compiled three existing works by Sheng to create and premiere the ballet Chi-Lin, which then toured to NYCB and the Kennedy Center. In 2011, Sheng founded and served as the Artistic Director of The Intimacy of Creativity — The Bright Sheng Partnership: Composers Meet Performers in Hong Kong, an annual two-week music festival with new approach to creativity. To celebrate its fifth anniversary in 2016, the festival collaborated with the Hong Kong Philharmonic and Hong Kong Arts Festival for two concerts at the Hong Kong City Hall and Hong Kong Cultural Center, including a Five-Year Retrospective concert and a two-disc Naxos Records release. Committed to the importance being both a performer and a composer, Sheng maintains an active performing career as a conductor and concert pianist, having conducted orchestras such as the San Francisco, Detroit, Shanghai, and Seattle Symphonies, the St. Petersburg, Dortmund, and Hong Kong Philharmonics, and performed as a pianist at the Tanglewood Music Center, Chamber Music Society of Lincoln Center, Kennedy Center, Spoleto USA Festival, and many others. Sheng's music has been recorded on Sony Classical, Decca/London Records, Naxos, Telarc, BIS, Delos, Koch International, New World, and several other labels. Eleven all-Sheng albums have been released on Telarc, Naxos, BIS, Delos, and New World Records. In addition to the Lyric Opera of Chicago and New York City Ballet, Sheng has served as composer-in-residences to the Seattle Symphony Orchestra (1992-95 and 2000-01) the Tanglewood Music Center (2001, where he also taught from 2001 through 2006), the Washington Performing Arts Society (2001-02), the Mannes College of Music (2002-03), the Atlantic Center for the Arts (2002). Sheng has collaborated with such distinguished musicians as Leonard Bernstein, Kurt Masur, Christoph Eschenbach, Charles Dutoit, Michael Tilson Thomas, Leonard Slatkin, Gerard Schwarz, David Robertson, David Zinman, Neeme Järvi, Robert Spano, Hugh Wolff, Yo Yo Ma, Emanuel Ax, Gil Shaham, Yefim Bronfman, Lynn Harrell, Peter Serkin, Chao-Liang Lin, Evelyn Glennie, among others. He has been widely commissioned and performed by the top musical institutions in North America, Europe, and Asia, including the New York Philharmonic, Boston Symphony Orchestra, Cleveland Orchestra, Chicago Symphony, Philadelphia Orchestra, San Francisco Symphony, LA Philharmonic, Minnesota Symphony, Royal Concertgebouw Orchestra, Orchestra de Paris, BBC Symphony, Hamburg Radio Symphony, Danish National Symphony, San Francisco Opera, Lyric Opera of Chicago, Santa Fe Opera, New York City Opera, New York City Ballet, and San Francisco Ballet. 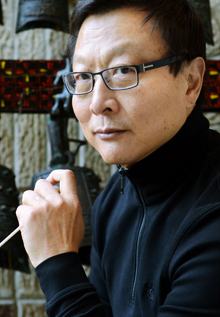 Sheng has taught composition at the University of Michigan since 1995, where he is the Leonard Bernstein Distinguished University Professor of Music. He is also the Y. K. Pao Distinguished Visiting Professor of Humanities at Hong Kong University of Science and Technology, where he directs the IC festival and other arts related activities. His music is published exclusively by G. Schirmer. For specific inquiries about this composer, please contact Andrew.Stein-Zeller@schirmer.com or call 212-254-2100 x 1134.